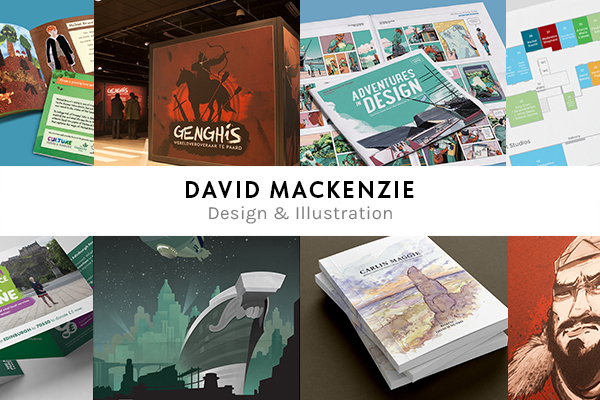 David MacKenzie is a freelance designer & illustrator with a passion for design that inspires and informs. For over six years he has been working with a variety of companies in the heritage, culture and education sector, listening to the stories that clients want to tell and helping them bring those tales to life, from conception to completion, through vivid illustrations and entertaining, inspiring multimedia design, in projects that have exhibited across the globe. Working in a freelance capacity for a variety of private clients and design agencies, in-house and from his studio in Newcastle NSW, he excels at creating everything from illustration and exhibition interpretation to branding, classroom resources, publications and newsletters.